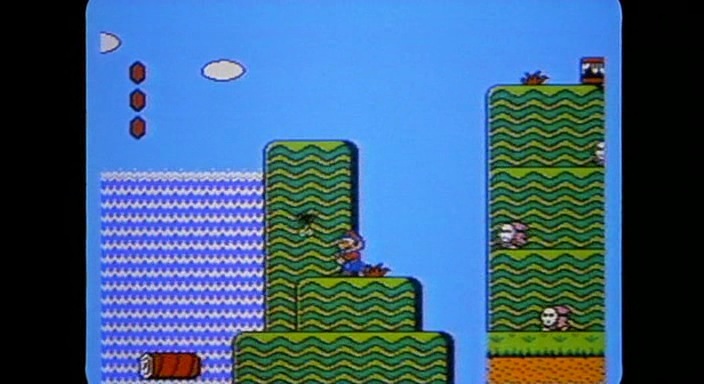 The Wizard was one factor behind Super Mario Bros. 3's record sales. Near the end of the movie, rivals Jimmy and Lucas have been competing in the Video Armageddon tournament. 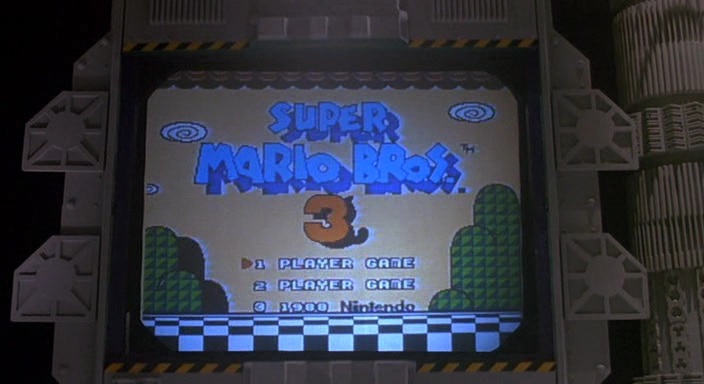 As fate would have it, they meet in the finals and have to play... Super Mario Bros. 3! 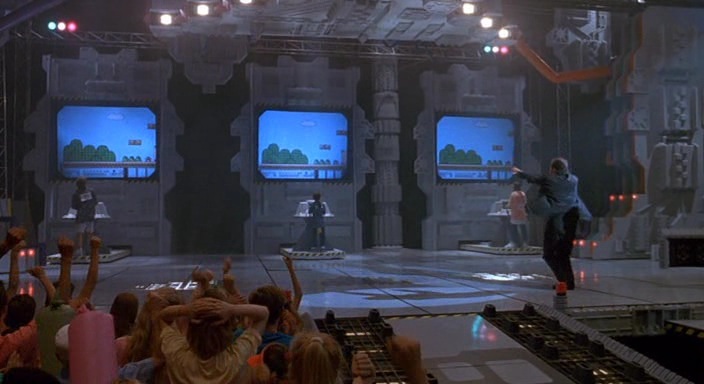 And thus, the scene becomes a big-screen commercial for SMB3 (never mind the fact that the entire movie is pretty much a Nintendo commercial). 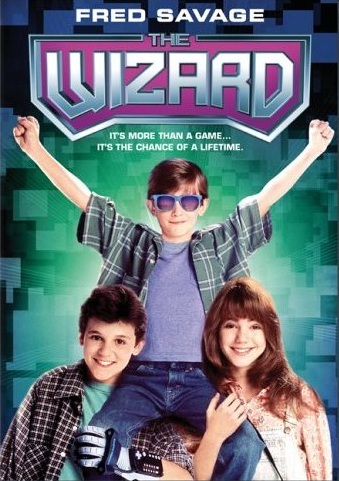 When The Wizard was released, SMB3 wouldn't be out in the U.S. for another two months, but knowledge of all aspects of the game are miraculously bestowed upon Jimmy and his friends in the crowd. For example, Jimmy can make Mario fly and pick up shells, while his half-brother Corey and friend Haley shout out tips about the Warp Whistles. 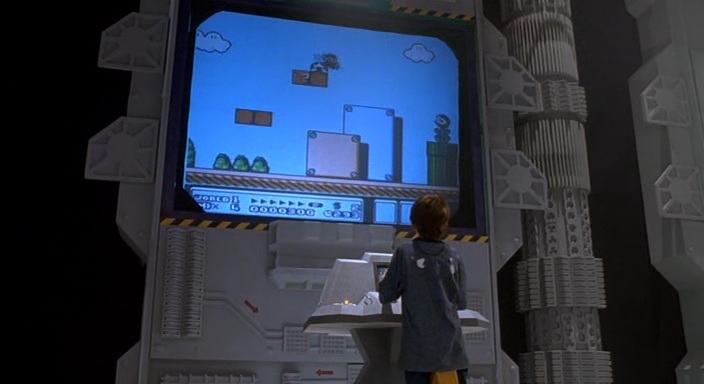 Earlier in the movie, about four seconds of Super Mario Bros. 2 footage is seen during the montage where Jimmy is training for the tournament. Mario also appears on the VHS box art. On March 1st, 2001, VCL Communications released Joy Stick Heroes (the European equivalent of The Wizard) on DVD in Germany. The Wizard DVD released in the U.S. much later: August 29th, 2006. A boy and his two friends travel to California to compete in the ultimate video game tournament. Having beaten the Video Armageddon semifinalists in Ninja Gaiden, Jimmy and co. head for the finals, while being chased by Putnam. Emcee: Gimme gimme gimme, Jimmy Woods! Jimmy is nowhere in sight. Emcee: Jimmy! Jimmy, Jimmy, Jimmy... WOODS! Emcee: I give you, Video Armageddon!! The wall opens up behind Emcee, Lucas, and Mora, revealing three video screens. Much to everyone's surprise, Jimmy is standing in front of the middle screen. 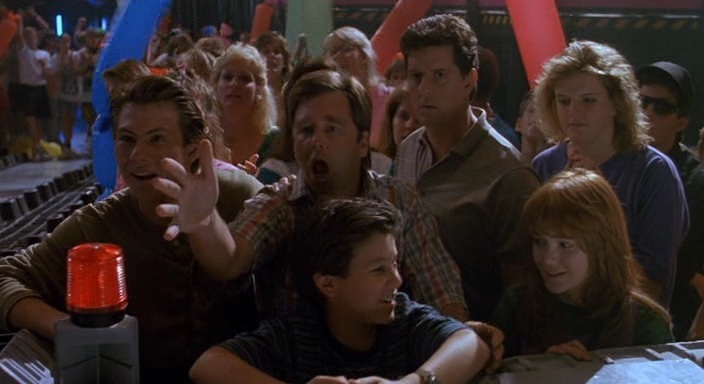 Corey: (in crowd with Haley) Go for it, Jimmy! Emcee: So I give you... Super Mario Bros. 3! 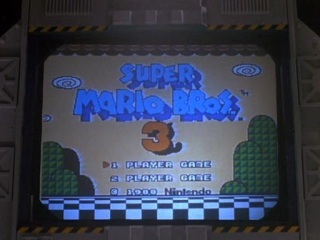 The video screens open up to show the Super Mario Bros. 3 title screen and World 1 Map. Emcee: TO YOUR STATIONS! You have 10 minutes, and the player with the most points wins! On a little TV set, three knights get into position, each one with the contestant's name behind it. Jimmy, Lucas, and Mora enter World 1-1. The word "GO" flashes on the little TV and the knights start running as the contestants score their points. A ten-minute timer begins ticking while the announcer announces scores in the background. Emcee: We enter World 1! Announcer: Lucas Barton - 1,300. Jimmy Woods - 1,300. Mora Grissom - 400. Emcee: (to crowd) Come on, come on, come on, come on, come on, come on, come on, come on, let's hear it for the Video Junkies! Wham, bam, yes yes yes! Corey & Haley: You can do it! You can do it! Come on! Enter Nick and Jimmy's father. Sam Woods: Corey, Corey! Jimmy! Jimmy! Nick Woods: He's a finalist? Sam Woods: Why didn't you tell me? He's a finalist! My son's a finalist... JIMMY!!! WATCH THE MUSHROOMS! As the announcer speaks, we can see the action on the SMB3 games. Lucas runs over the gap and gets two Coins, Mora only gets one, but Jimmy has gotten a Super Leaf and has become Raccoon Mario. He flies up to the cloud area. After Mrs. Bateman enters, Lucas finishes World 1-1, as does Jimmy. 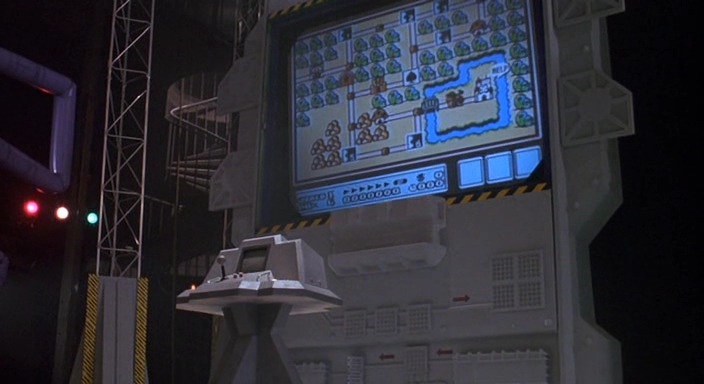 But Mora is still having trouble on getting past the last Koopa Troopa in the stage. Emcee: Lucas second, Jimmy leads! On the little TV, Jimmy's knight runs ahead of Mora's and Lucas'. Sam Woods: Faster, faster! Yahoo! Nick Woods: He's a changed man, this guy! Nick Woods: Come on shorty, I love ya! Corey: Stomp on him! Get him! Jimmy's Mario stomps on the first Koopa Troopa of the stage and picks it up. Corey: Okay, now find a warp, dude, find a warp! (to Haley) If he finds a warp, he can jump points. Haley: GET IT, JIMMY! GO GO GO! Lucas enters World 1-3 and stomps the Koopa Troopa. The counter reaches 06:53. In the audience, Putnam approaches Mrs. Bateman. Putnam: Well, we got him cold now. I flushed 'im out. Course, we still have a deal, Mrs. Bateman. Jimmy's Mario has lost his Raccoon power. He gets hit by a Boomerang Bro. and loses a life. On the TV, Jimmy's knight hits a brick wall. Corey: The turtle hit him with his boomerang! (to Jimmy) You're gonna have to start over, Jimmy! Just stay calm, OK? Stay calm! Lucas' Mario has almost reached the end of World 1-3. But it seems Mora still has trouble on 1-1. Jimmy restarts World 1-3. Emcee: And Jimmy loses a life and starts over in... World 2! Lucas gets to the end of World 1-3. Emcee: Lucas finishes World 2! Mora gets to the end of World 1-1. Emcee: And Mora finishes World 2! Jimmy's Mario is about to beat World 1-3, but he gets hit by a Paragoomba and loses another life. Haley: Oh no! He's lost another guy. He's gonna have to start all over again. Emcee: Jimmy begins World 2 again! Lucas and Mora are both playing the sliding puzzle game. Lucas gets a perfect Mushroom and gets a 2-Up. Mora doesn't. Meanwhile, Jimmy's Mario got his hands on a Magic Mushroom and has reached the end of World 1-3. Haley: The star, Jimmy! Get the star! On the TV, Jimmy's knight runs faster and catches up with the other knights. Emcee: Jimmy finishes World 2! Haley: I knew- I knew you can do it. Just go! Just go! Jimmy plays the sliding game and wins a 2-Up. The timer reaches 02:07. Lucas enters World 1-Fortress. Jimmy does the same. Lucas's Mario gets a Fire Flower and becomes Fiery Mario. Jimmy's Mario has become Raccoon Mario again and flies over the ceiling to find the Warp Whistle. Emcee: Jimmy's found the secret passageway! The timer has by now reached 00:59. Jimmy gets the Warp Whistle. Haley: That's the magic flute! Use it! Use it! It opens the warp! Jimmy's Mario gets out of World 1-5 and uses the Warp Whistle and heads for the Warp Zone (World 9). 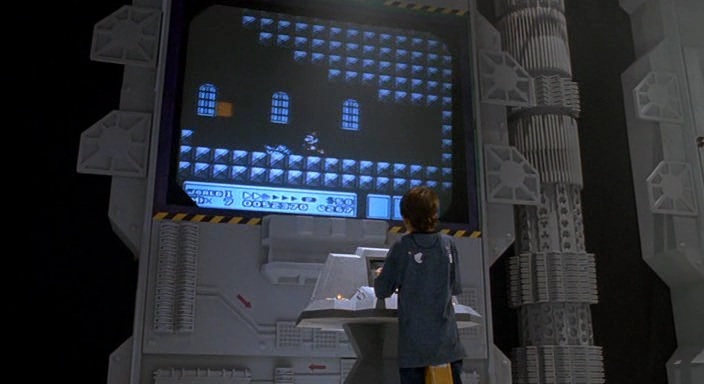 On the TV, Jimmy's knight finds a warp zone and accesses it, with SMB1 sound effects included. Emcee: Jimmy finds the WARP ZONE! Corey: Yes! Yes! He found the warp! Jimmy's Mario whizzes on through World 4-1. Meanwhile, Lucas's Mario is still stuck in the World 1-Fortress, and Mora's Mario loses a life on World 1-4. Nick Woods: She's out! She's out! She's out! Corey: Come on, Jimmy, score! Score! Haley: Get the star, Jimmy! The star! Jimmy reaches the end of World 4-1 and gets a Starman card, boosting his points way ahead of Lucas's and Mora's. The little TV flashes some symbols and then "WINNER" and "JIMMY". Emcee: Holy moly! (holds up Jimmy's left arm) And the winner is Jimmy Woods from Utah! Lucas looks down in sadness while Mora just stands there. Immense cheering. Putnam: YEAH! I KNOW THAT KID! YEAH! WAY TO GO! Jimmy smiles at Corey and Haley and they smile back at him. The crowd cheers Jimmy on as the scene ends.